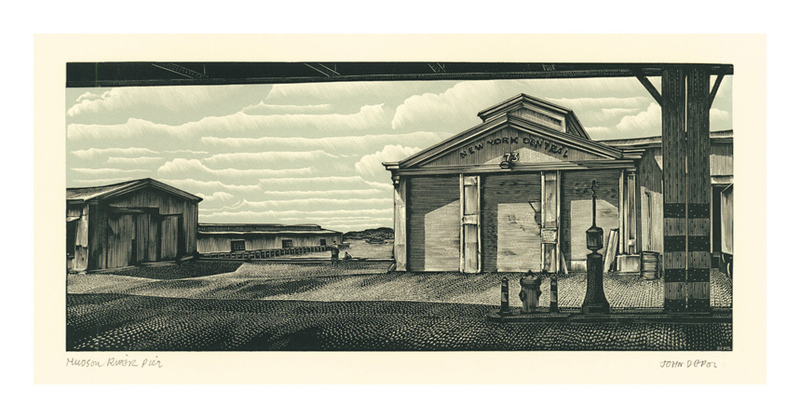 Station on 9th Avenue Elevated - New York - 1938- - - 1942, Etching. Edition not stated. Signed, dated and titled in pencil. Signed in the block, lower right. 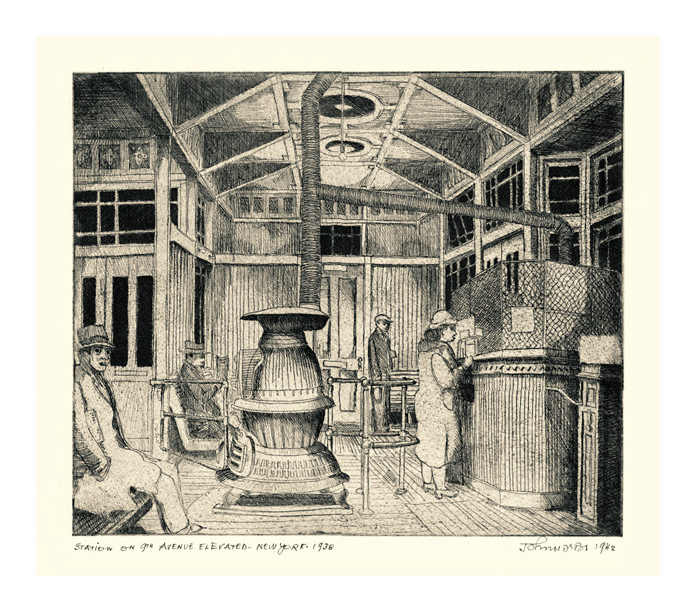 Image size 7 x 8 3/8 inches (178 x 213 mm); sheet size 9 3/8 x 11 inches (238 x 279 mm). A fine, rich impression, on cream wove paper, with full margins (7/8 to 1 1/2 inches), in excellent condition. 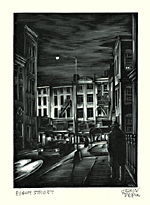 Election Night, Barrow Street- - - 1942, Wood Engraving. Edition 150. Signed, dated and titled in pencil. Signed in the block, lower right. Image size 4 1/4 x 5 1/8 inches (108 x 130 mm); sheet size 11 1/2 x 8 3/4 inches (292 x 222 mm). A fine impression, on off-white wove paper, with full margins (1 5/8 to 5 1/4 inches), in excellent condition. 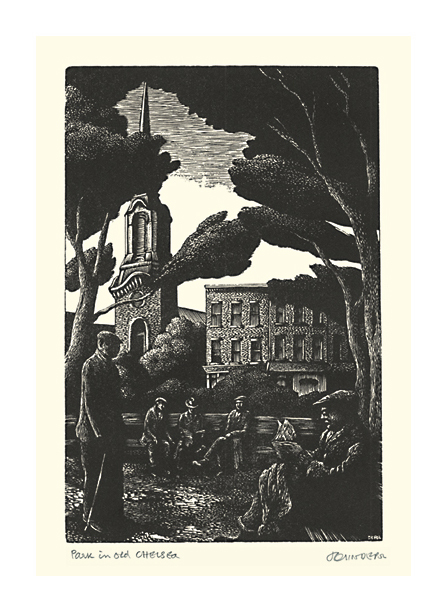 Washington Square- - - c.1948, Wood Engraving. Edition not stated. Signed and titled in pencil. Signed in the block, lower left. Image size 4 x 3 inches (102 x 76 mm); sheet size 8 1/2 x 5 7/16 inches (216 x 138 mm). A fine impression, on cream wove paper, with full margins (1 to 3 inches), in excellent condition. 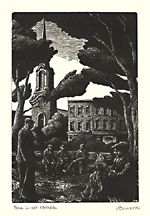 Park in Old Chelsea- - - c.1948, Wood Engraving. 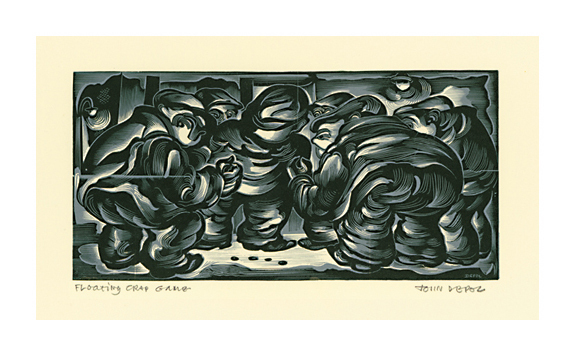 Edition proofs only from the block created c.1948. Signed and titled in pencil. Signed in the block, lower right. Image size 6 3/16 x 4 1/4 inches (157 x 108 mm); sheet size 11 1/2 x 8 3/4 inches (292 x 222 mm). A fine, rich impression, on off-white wove paper, with full margins (2 1/8 to 3 inches), in excellent condition. 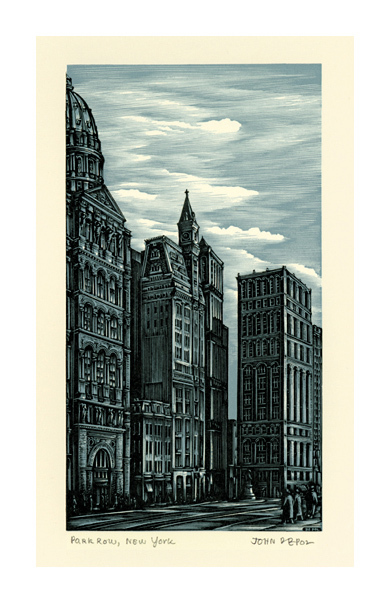 Sixth Avenue, Manhattan- - - 1949 (1st edition), Wood Engraving. Edition not stated. Signed and titled in pencil. Signed in the block, lower right. Image size 8 3/8 x 4 7/8 inches (213 x 124 mm); sheet size 12 5/8 x 9 inches (321 x 229 mm). A fine impression, on cream wove paper, with full margins (1 3/4 to 2 1/2 inches), in excellent condition. 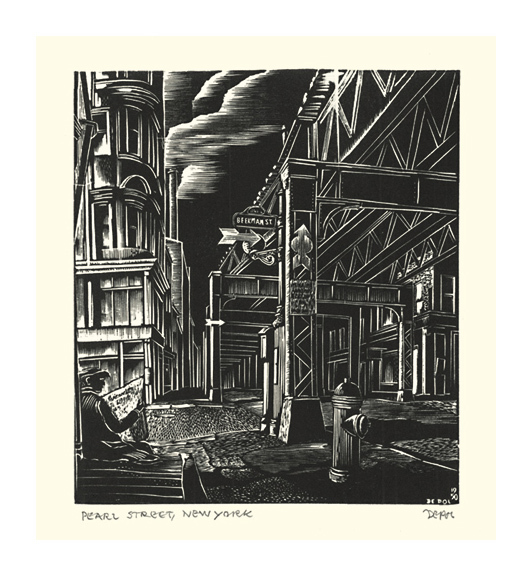 Pearl Street, New York- - - 1950, Wood Engraving. Image size 6 x 5 inches (152 x 127 mm); sheet size 11 x 8 1/2 inches (279 x 216 mm). A fine impression, on off-white wove paper, with full margins (1 3/4 to 3 inches), in excellent condition. 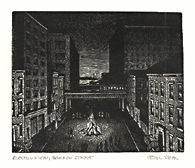 Park Row, New York- - - c.1950, Chiaroscuro Wood Engraving. Image size 5 7/8 x 3 1/4 inches (149 x 83 mm); sheet size 10 x 6 1/2 inches (254 x 165 mm). A fine, rich impression, on cream wove paper, with full margins (1 1/2 to 2 5/8 inches), in excellent condition. 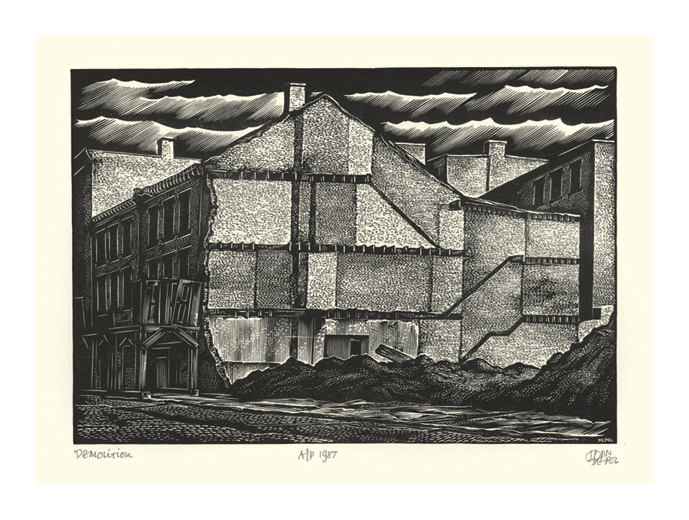 Demolition- - - c.1950, printed in 1987, Wood Engraving. 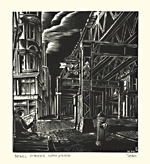 Image size 5 1/4 x 7 1/2 inches (133 x 191 mm); sheet size 8 3/4 x 11 1/2 inches (222 x 292 mm). A fine impression, on cream wove paper, with full margins (1 1/2 to 2 inches), in excellent condition. 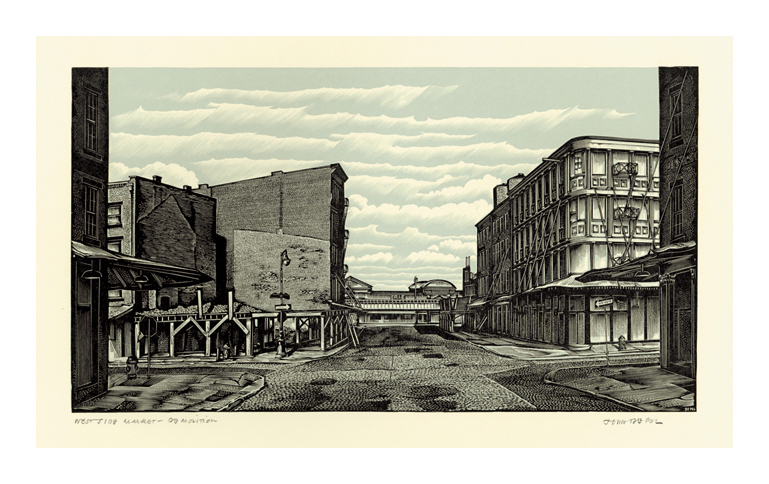 South Street Seaport- - - c.1950, Wood Engraving. Image size 2 x 4 5/8 inches (140 x 238 mm); sheet size 8 15/16 x 10 15/16 inches (227 x 278 mm). A fine impression, on off-white wove paper, with full margins (1 1/4 to 8 inches), in excellent condition. 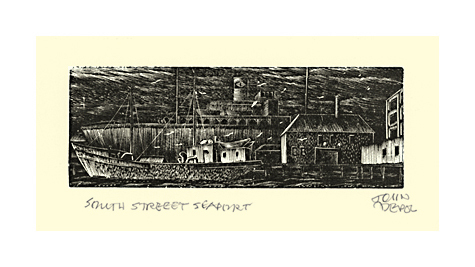 South Street- - - 1950, Wood Engraving. Edition not stated. Signed in ink. Signed in the block, lower right. Image size 5 7/16 x 3 inches (138 x 76 mm); sheet size 11 x 7 1/8 inches (279 x 181 mm). A fine, rich impression, on cream wove paper, with full margins (2 to 2 7/8 inches), in excellent condition. 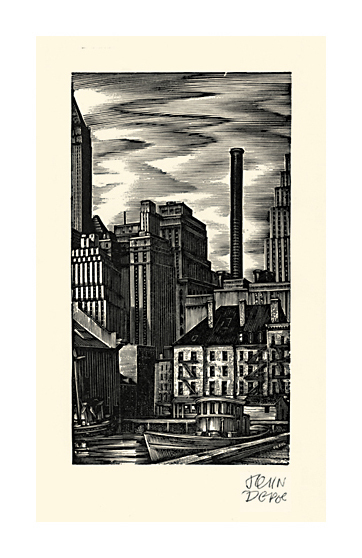 North Riverfront- - - 1953, Wood Engraving. Edition not stated. Signed, dated and titled in pencil. Signed in the block, lower left. Image size 4 3/16 x 6 1/16 inches (106 x 154 mm); sheet size 7 1/8 x 8 5/8 inches (181 x 219 mm). A fine impression, on cream wove paper, with full margins (1 1/4 to 1 1/2 inches), in excellent condition. 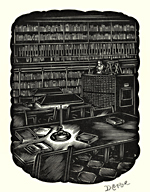 Floating Crap Game- - - 1958, Chiaroscuro Wood Engraving. Edition 145. 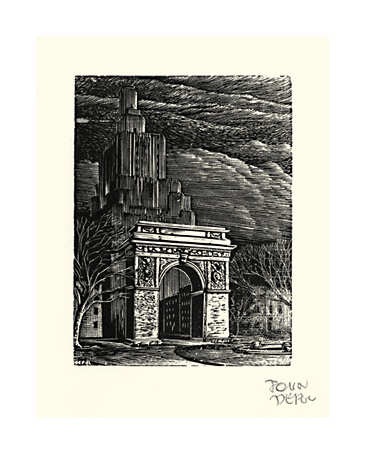 Signed, titled, dated 3/1958 and numbered Ed.145 in pencil. Image size 2 7/8 x 5 7/8 inches (74 x 149 mm); sheet size 6 3/8 x 9 7/8 inches (162 x 250 mm). A fine, rich impression, on cream wove paper, with full margins (1 3/4 to 2 inches), in excellent condition. The image showing a crack in the black block, center left. 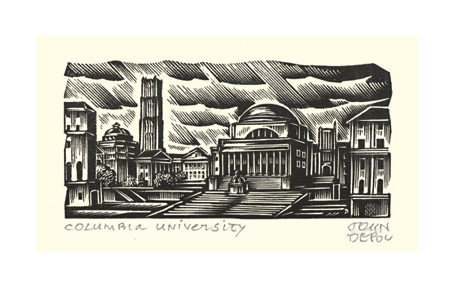 Columbia University- - - Undated, Wood Engraving. 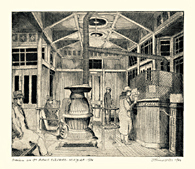 Image size 1 15/16 x 4 inches (49 x 102 mm); sheet size 6 x 11 inches (152 x 279 mm). A fine, rich impression, on off-white wove paper, with full margins (1 1/4 to 3 1/2 inches), in excellent condition. 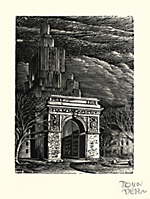 The Pierpont Morgan Library- - - Undated, Wood Engraving. 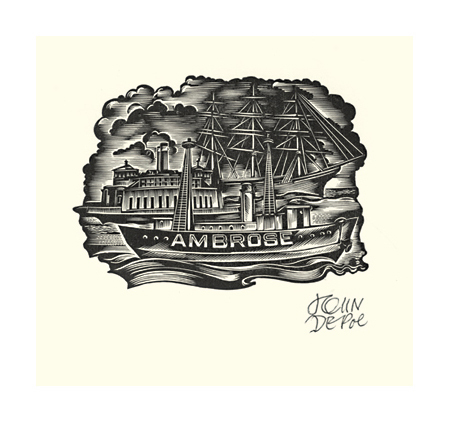 Image size 4 1/4 x 3 1/8 inches (108 x 79 mm); sheet size 10 1/4 x 8 1/2 inches (260 x 216 mm). A fine, rich impression, on cream wove paper, with full margins (2 to 4 inches), in excellent condition. 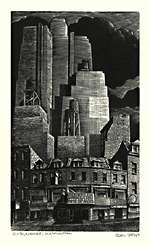 Miniature Cityscape- - - Undated, Wood Engraving. Edition not stated. Signed in pencil. Signed in the block, lower right. 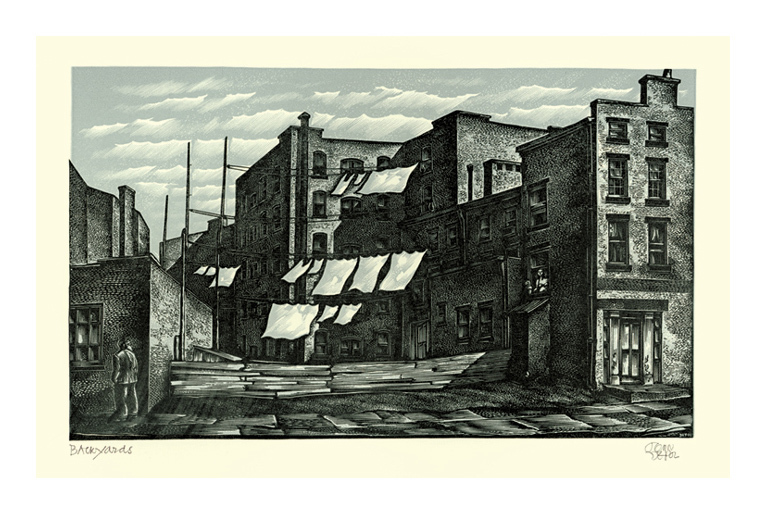 Image size 1 11/16 x 2 9/16 inches (43 x 65 mm); sheet size 8 1/2 x 11 inches (216 x 279 mm). A fine impression, on off-white wove paper, with full margins, in excellent condition. 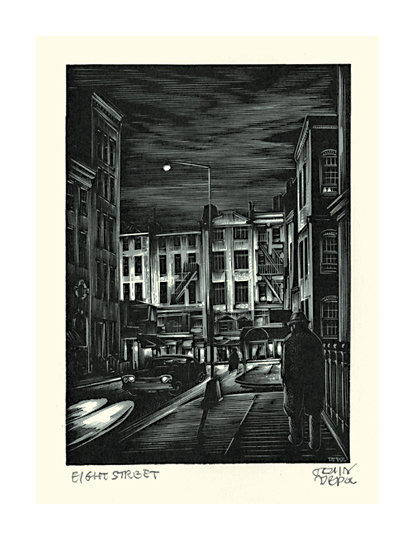 Eighth Street- - - c.1968, Chiaroscuro Wood Engraving. Image size 4 13/16 x 3 1/2 inches (122 x 89 mm); sheet size 8 x 6 inches (203 x 152 mm). 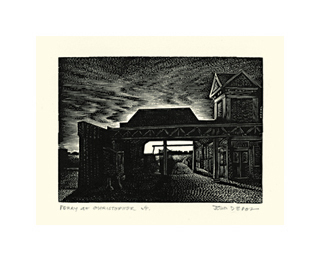 Homeward Ferry- - - 1968, Wood Engraving. Edition not stated. Signed in pencil. Signed in the block, lower left. Image size 2 1/16 x 2 15/16 inches (52 x 75 mm); sheet size 4 15/16 x 8 inches (125 x 203 mm). A fine impression, on cream wove paper, with full margins (1 3/8 to 2 3/4 inches), in excellent condition. 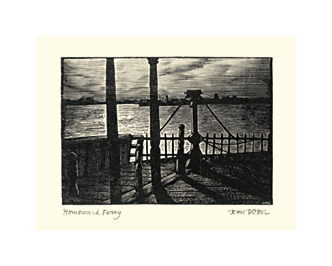 Ferry at Christopher Street- - - c.1968, Wood Engraving. Edition not stated. Signed and titled in pencil. Signed in the block, upper right. Image size 2 x 2 7/8 inches (51 x 73 mm); sheet size 5 7/8 x 6 15/16 inches (149 x 176 mm). A fine impression, on cream wove paper, with full margins (1 5/8 to 2 1/4 inches), in excellent condition. 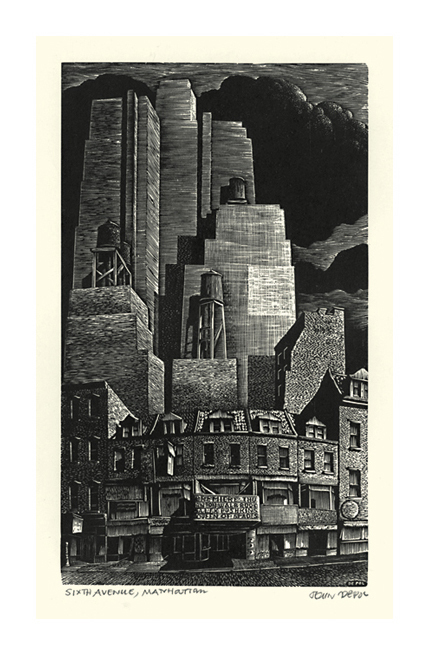 Westside Market - Demolition- - - 1967, Chiaroscuro Wood Engraving. Edition not stated. Signed, dated, titled and numbered No. 71 in pencil. Signed in the block, lower right. Image size 5 5/8 x 10 1/4 inches (143 x 260 mm); sheet size 9 1/2 x 14 inches (241 x 356 mm). A fine impression, on cream wove paper, with full margins (1 7/8 to 2 inches), in excellent condition. 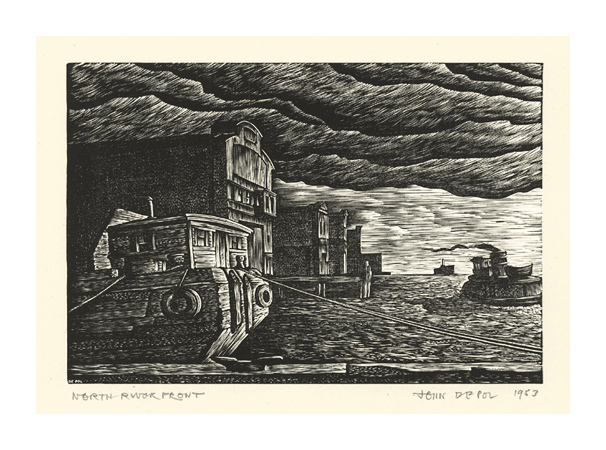 Hudson River Pier- - - 1968, Chiaroscuro Wood Engraving. Edition not stated. Signed, dated, titled and numbered No. 49 in pencil. Signed in the block, lower right. 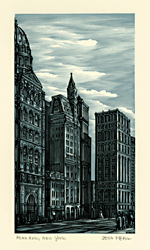 Image size 4 x 9 1/8 inches (102 x 232 mm); sheet size 7 1/4 x 12 inches (184 x 305 mm). A fine, rich impression, on cream wove paper, with full margins (1 1/2 to 1 7/8 inches), in excellent condition. 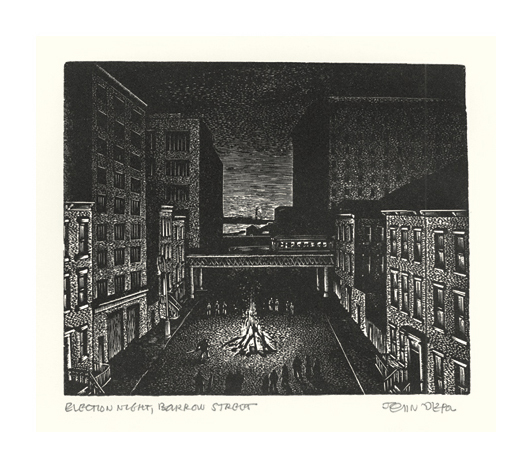 Westside, Manhattan- - - 1968, Chiaroscuro Wood Engraving. 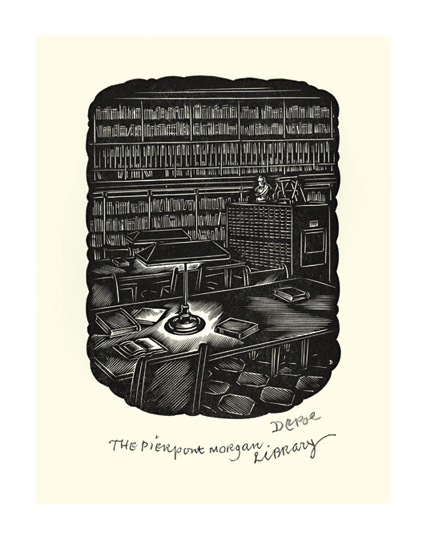 Image size 5 1/4 x 8 3/4 inches (133 x 222 mm); sheet size 8 1/2 x 11 inches (216 x 279 mm). A fine impression, on cream wove paper, with full margins (1 1/8 to 1 7/8 inches), in excellent condition. 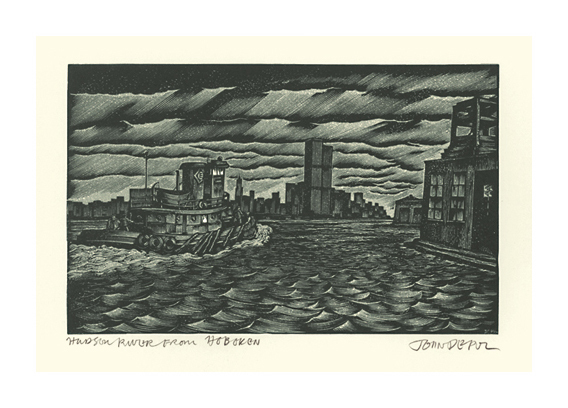 Hudson River from Hoboken- - - 1973, Chiaroscuro Wood Engraving. Image size 3 3/4 x 6 inches (95 x 152 mm); sheet size 8 1/2 x 11 inches (216 x 279 mm). A fine impression, on cream wove paper, with full margins (2 to 2 7/8 inches), in excellent condition. 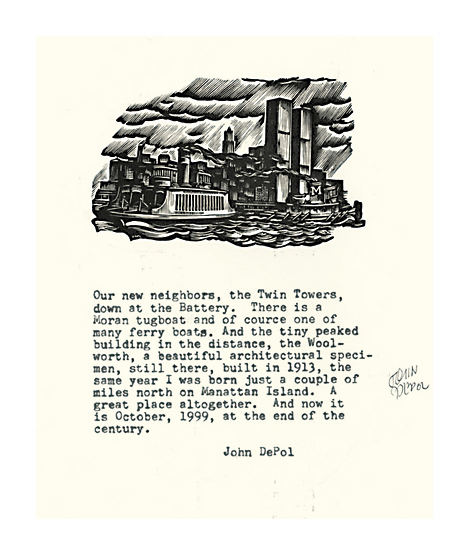 Twin Towers- - - 1977, Wood Engraving. Image size 2 5/16 x 3 13/16 inches (59 x 97 mm); sheet size 9 x 6 inches (229 x 152 mm). A fine impression, on off-white wove paper, with full margins (7/8 to 2inches), in excellent condition. 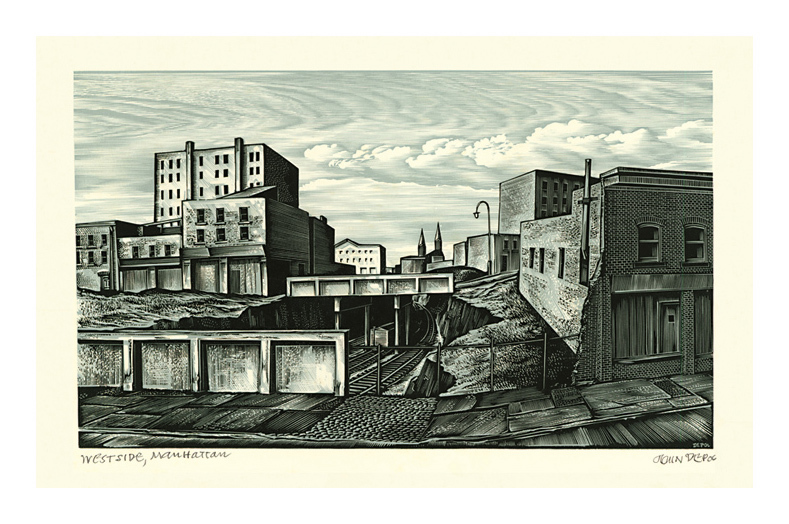 Backyards- - - 1981, Chiaroscuro Wood Engraving. Edition 135. Signed, dated and titled in pencil. Signed in the block, lower right. Image size 5 1/2 x 9 3/8 inches (140 x 238 mm); sheet size 10 1/4 x 13 3/4 inches (260 x 349 mm). A fine impression, on off-white wove paper, with full margins (2 1/8 to 2 1/2 inches), in excellent condition. 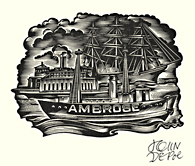 Untitled (Ambrose Shipping)- - - c.1984, Wood Engraving. Edition 15. 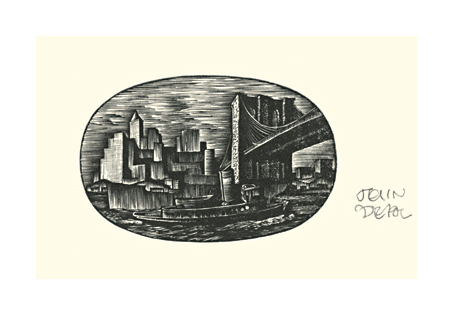 Signed in ink; annotated FOR BOWNE & CO. SOUTH STREET SEAPORT MUSEUM OCT. 6 1984 in pencil. Signed in the block, lower right. Image size 2 5/8 x 3 1/2 inches (67 x 89 mm); sheet size 11 1/2 x 8 3/4 inches (292 x 222 mm).